عباسی حسین آبادی, حسن. (1394). رهیافت سلبی صفات خدا از دیدگاه ابن‌سینا و توماس آکویینی. دوفصلنامه علمی پژوهشی حکمت اسرا, 7(4), 35-54. حسن عباسی حسین آبادی. "رهیافت سلبی صفات خدا از دیدگاه ابن‌سینا و توماس آکویینی". دوفصلنامه علمی پژوهشی حکمت اسرا, 7, 4, 1394, 35-54. عباسی حسین آبادی, حسن. (1394). 'رهیافت سلبی صفات خدا از دیدگاه ابن‌سینا و توماس آکویینی', دوفصلنامه علمی پژوهشی حکمت اسرا, 7(4), pp. 35-54. عباسی حسین آبادی, حسن. رهیافت سلبی صفات خدا از دیدگاه ابن‌سینا و توماس آکویینی. دوفصلنامه علمی پژوهشی حکمت اسرا, 1394; 7(4): 35-54. Negative approach to speaking of divine attributes is an age-old discussion and has two main categories: the negation and silence and the negative-positive way. The negative-positive way has various interpretations and meanings. Some of them are in conflict with inexpressibility of the God, and others are not. Some of them are not in agreement with silence and have a positive approach about God. What is the meaning of negative-positive approach for Avicenna? What is the relation between this way and the inexpressibility of God for Avicenna? What is his purpose in using this way for expressing the divine attributes? In the present paper, after reviewing different meanings of negative-positive way for Avicenna and Aquinas, we will discuss Avicenna’s overall position (returning of all divine attributes to negation and relation) alongside the comparative analysis of Aquinas views. ابن‌سینا، (1375ش)، الاشارات والتنبیهات مع شرح خواجه نصیر الدین طوسی وقطب الدین رازی، نشر البلاغه، قم. ابن سینا، (1363)، مبدأ والمعاد، به اهتمام عبدالله نورانی، مؤسسه مطالعات اسلامی دانشگاه مگ گیل شعبۀ تهران. ابن سینا، (1418)، الهیات من کتاب الشفاء، آیت الله حسن زاده آملی، مکتبه الاعلام الاسلامی، مرکز نشر، قم. ابن سینا، (1379)، التعلیقات، چ4، مرکز انتشارات دفتر تبلیغات اسلامی حوزه علمیه، قم. ابن سینا، (1390)، الهیات از کتاب شفا، ویرایش و ترجمۀ ابراهیم دادجو، امیرکبیر، تهران. ابن سینا، (1364)، النجاه من الغرق فی بحر الضلالات، مقدمه و تصحیح محمدتقی دانش‌پژوه، چ2، دانشگاه تهران، تهران. ابن‌سینا، (1371)، المباحثات، محسن بیدارفر، بیدار، قم. افلاطون، (1380)، مجموعه آثار، 4.ج، محمد حسن لطفی، خورازمی، تهران. افلوطین، (1361)، مجموعه آثار، (ج.2)، محمدحسن لطفی، خوارزمی، تهران. ایلخانی، محمد، (1382)، تاریخ فلسفه در قرون وسطی و رنسانس، سمت، تهران. ایلخانی، محمد، (1380)، متافیزیک بوئتیوس، الهام، تهران. جوادی آملی، (1375)، رحیق مختوم، مرکز نشر اسراء، قم. ذبیحی، محمد، (1389)، فلسفه مشاء با تکیه بر اهم آراء ابن‌سینا، چاپ چهارم، سمت، تهران. علیزمانی، امیرعباس، (1387)، سخن گفتن از خدا، چ2، سازمان انتشارات پژوهشگاه فرهنگ و اندیشه های اسلام، تهران. Aquinas, Thomas,(1952), Summa Theologia, Danile J. Sullivan, Part 1, by Encyclopedia Britannica, INC. NewYork, London, Toronto. Aquinas, Thomas, (2005), Summa Contra Gentile, by Joseph Rickaby, S.j. The Catholic Prlmer. Aquinas, Thomas, (1955), Summa Contra Gentile, by Joseph P. Ascherl, Francis Cardinal Spellman Archbishop of New York. Copleston Fredrick, (1985), A History of Philosophy, V.2, Augustine to Scouts, Image Book. Gilson Etienne, (1966), The Christian Philosophy of Aquinas, Random House, New York. Kenny, Joseph, (1999), Christian Islamic Problems of Faith Aquinas. 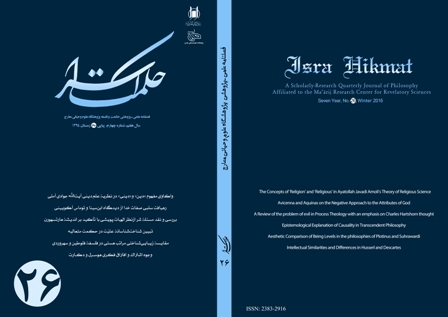 Cultural Heritage and Contemporary Change Series IIa, Islam, the Council for research in Values and Philosophy, R. V. P. Volume. 10. Quinn Patrick, (1996), Aquinas, Platonism and Knowledge of God, Avebury Series in Philosophy.